Outlined on this page is my section on a selection of totally tubular tools, exuberantly entrancing equipment, greatly gifted gadgets, and astoundingly amazing apps that can be beneficial with dealing with Dyspraxia/DCD. Dyspraxia isn’t curable, so we make the most of what we can – this approach is what makes us fantastic! The effectiveness of these tools and apps will vary from person to person and I must add that even though they can really help with tasks it can make you/them stand out more among peers. Clicking each topic box will provide more information. This handy wallet-sized card and keyring card provides essential information on how to assist someone who has dyspraxia. This includes explanations of the difficulties with social interaction, communication, and understanding – this can help so that any actions are not misinterpreted. 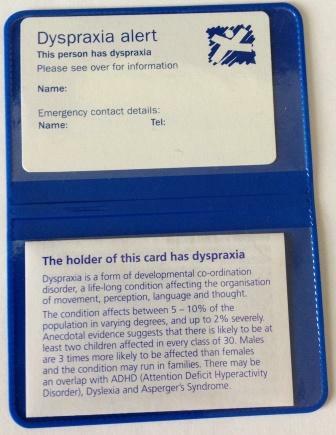 The Dyspraxia alert card also includes a pull-out information sheet. These can be bought from the Dyspraxia Foundation online store. 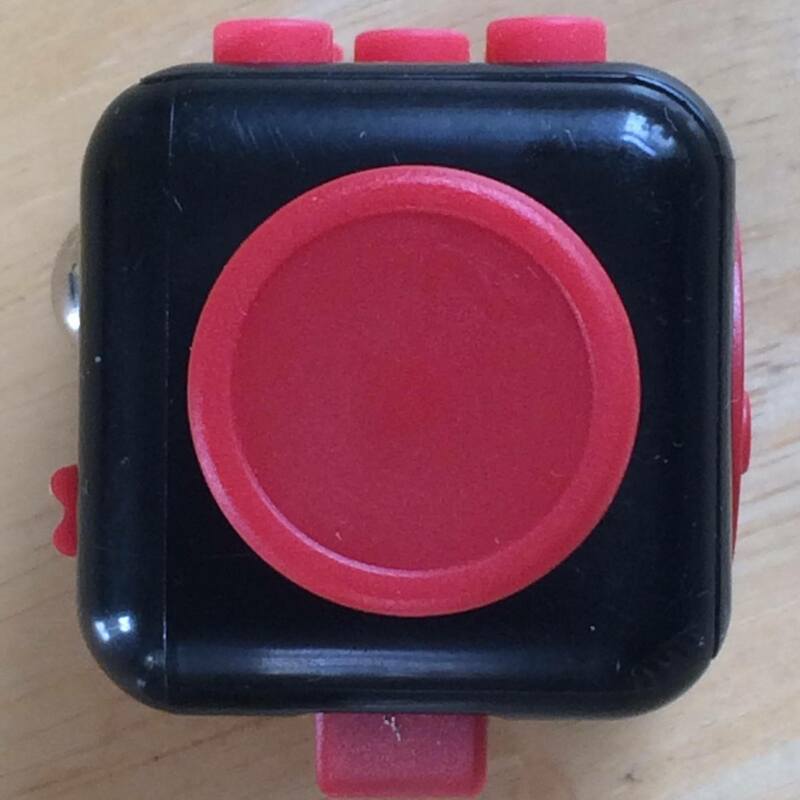 There are many gadgets, gizmos, and toys that help aid in concentration and defuse stress. Fidget Spinners certainly became infamous during the mid-2017 period and did cause unneeded negative attention. There are plenty of different types of gadgets out there, and I recommend trying different ones to see which works best for you. Sometimes different situations can be resolved with a different toy. Stress-balls: Stressballs are great and something I highly recommend for anxiety. There are different sizes and softness available, so it depends on your own preference. The downsides are that stress-balls are bulky and squeezing too much can cause Repetitive Strain Injury (RSI). Also if dropped they can roll away. Chinese Worry Balls (not pictured): These are a couple of metallic balls that you use to grind together to relieve stress. I’ve never used them myself so cannot comment, however, I imagine they’ll take some getting used to – especially with coordination difficulties. Worry Stone/Palm Stone/Thumb Stone (not pictured): The smooth pebble with many names! Fits nicely in the hand, between the index finger and thumb. There is an indentation to rub your thumb gently across. Subtle and simple in design. Oidz/Snake Eggs Magnets: Cheap as chips online and can be like Chinese worry balls. The downside is that they can make a loud ‘zing!’ noise if they hit each other, which can be very distracting if used in a public place. Coins: I find coins useful to relieve stress, especially if I’m waiting for a bus or in a queue. Waiting to pay for something and having coins in your hand is discrete and won’t attract attention. Only trouble is that coins can be very dirty and so not recommended for every situation. Fidget Spinner: This controversial gadget, becoming infamous during its faze in the mid-2017’s. Because of the popularity, they were more of a distraction than a useful tool. My issue with fidget spinners is that they take two hands to properly use. They are bulky and the spinning motion can distract other people. Wrist Band: These were extremely popular a few years back and were often used to advertise charities and movements (pictured is the Dyspraxia Foundation one). Being on the wrist it’s difficult to lose and will bounce back to its original hoop shape. The only issue is that they can snap easily if put under too much pressure, especially after time. Poster Putty: Squeeze it. Mold it. Roll it. So many uses and something I use from time to time to help get over times of stress. Pens/Stylus: The great thing about pens, especially the clicky ones, is that they do make a great tool against stress. With different sizes, textured grips, and unique ‘clickers’ you’re bound to find one that suits you. They’re also great to twirl around (styluses included on this). Mini-Joy Stick; for twirling around. Classic switch; similar to a light switch – can be toggled back and forth. Worry Stone: An indentation for rubbing, simple but effective. ‘Dice’ buttons; for pressing, 3 click and 2 don’t. Rollers: 3 ‘padlock’ type rollers and a metal ball (that can be clicked or rolled). There are different pencils/pens out there that are specially shaped that helps with writing such as Ring pens. There are many different sizes and styles and as such it’s best to try different ones to see which one works best. These are the funny rubbery things that bulk out pens and pencils allowing you to get a better grip or control of them. They come in a variety of colours, shapes, and sizes for your taste and needs. Because of the size they are easily transported and more discrete than other tools. Perhaps the pen grip is not enough. That is where the slanted desk comes right into play; you get some that are adjustable as well to suit individual needs. However, this will make the user stand out among peers. What is worth more, you must ask? The individual’s handwriting at the expense of being targeted? In reality, any bullying or harassment should be dealt with. These are keyboards with a small screen attached to the top. So instead of handwriting out everything, it can be typed up. + Saves time (as long as typing speed is faster than writing, of course). + No loose paper to lose. + Typing speed and accuracy can improve over time. – Handwriting will not improve. – Can be singled out by other students for using it. – Work needs to be printed out. My school had a few of these Word Processors that they gave to students who needed them. Most of the time it was for students who had a broken hand. On a rare occasion, it was also issued to those with handwriting difficulties. I was issued one to help get work done neatly and efficiently – and it worked really well for me. I was a slow writer and occasionally my hand ached if I was writing for too long (which slowed my writing down and made its legibility worst as a result). Because my hand wasn’t broken many of my classmates were quite angry as there was nothing wrong with me from their point of view (Of course, not true). I needed that processor because it would allow me to keep up the pace with the rest of the class. However, after a few weeks, I reverted back to struggling with a pen just because of students complaining. I needed to practice handwriting anyway and it did improve slowly, but not quick enough for my GCSEs. Can go without saying, but having notes (especially ones that notify you or ping your phone at certain times) can help keep track of what you need to do so you don’t forget anything! Has certainly helped me out on many occasions. Gaming apps can help in all sorts of ways, for a better run down then visit my gaming page: dyspraxicfantastic.com/video-gaming-dyspraxia/. There are many specific apps that can help with Dyspraxia/DCD and as I discover them I’ll add them to this section. Watch this space and if you have any useful apps that you have used or created then please, by all means, recommend them to me! Yes you read that right! Trampolines! They really helpful for children as they can learn about where they are in this world and as such, improve spatial awareness and coordination skills. Punching Bags, like trampolines, can help spacial awareness. They’re also used for taking out anger and frustration, which is useful. However, according to psychologists by acting out frustration in a physical way trains the brain to act on frustrating situations with violence. It is therefore deemed better to tackle frustration in a more constructive manner. There are so many gadgets and tools that can help and as I discover or think of them I’ll add it to this growing list. Please feel free to share your experiences of the above or any other that I have missed off. If you know of any other helpful tools not listed above then drop me a message and I can add it!